I’m pleased to welcome today another of the authors I first met at the Deadly Ink Mystery Conference back in August. Carol Gyzander kicked off this mini-series, writing about her story “Stars the Color of Hope,” and Teel James Glenn and Chris Ryan will be discussing their work down the road. 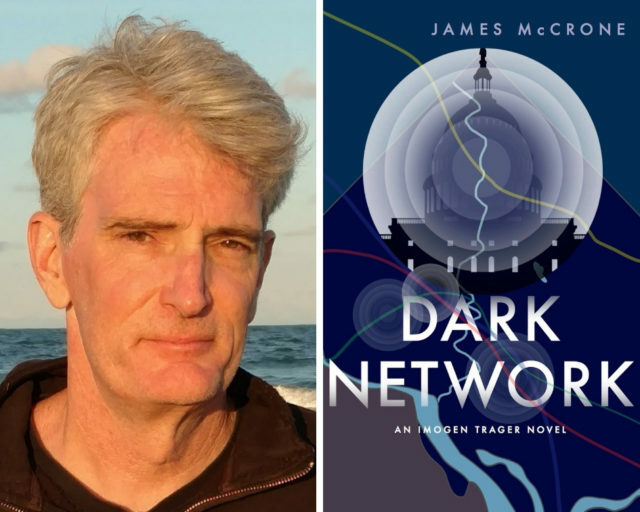 This week, James McCrone shares some insights into Dark Network, the second book in his Imogen Trager series of thrillers. Faithless Elector, the first book in the series, was praised by Publishers Weekly as a “fast-moving topical thriller” focused on the country’s first female president-elect and on conspiracy theories, allegations of voter fraud, and subsequent investigations of the FBI. Dark Network—picking up three days after the ending of Faithless Elector—continues the saga about a “stolen presidency,” and a third novel, Who Governs, is forthcoming before the end of 2018. You can get a glimpse at Dark Network in the essay below, and find out more about James McCrone and his work at his website here.